Somewhat before the beginning of the 20th Century, a logging town was established in Cass by the West Virginia Pulp & Paper Company for the workers at the sawmill and logging town. With plenty of wood from the nearby logging operations, wood was the building material of choice. (Notice the wooden sidewallks. ) This town provided for most of the needs of the workers associated with the logging operation. 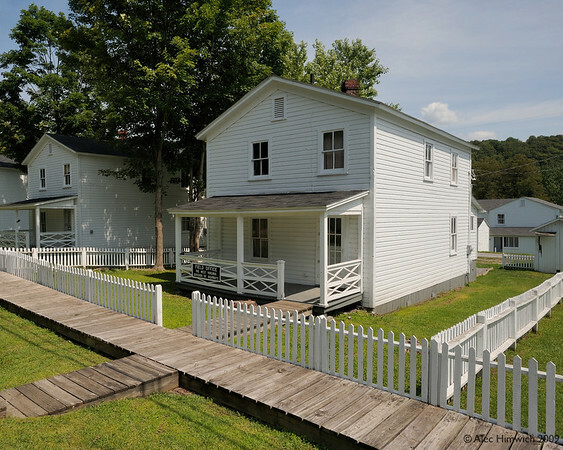 In addition to living quarters, the town had a resident physician and small hospital, a general store and a post office. This company town is an example of how some companies sought to provide for their workers in the 19th and early 20th Centuries. (I do not think this was actually an example of corporate altruism but rather a strategy to keep skilled workers handy and to enhance production.) The Ford Motor Company and Colt Manufacturing Company, for example, set up similar towns for its workers. When I joined IBM in 1981, corporate paternalism had diminished somewhat but was still present in terms of extensive benefits for workers. Seeing the transition from the company towns, to IBM in the late 20th Century, to today's "everyone for his/her own self" working environment, the direction of the future seems clear. Some of these cottages have been refurbished and are fully functional and can be rented by tourists. With their proximity to the sky area at Snowshoe, these cabins are popular in the winter time. They must be a wonderful place to stay to enjoy the surrounding forests in the Fall.